Boy do we have an interesting challenge for the SUO Challenge this time! The theme is ‘use your team colors’ for a card. Well if you know me, you know I live in Ohio…Xenia Ohio to be exact. But if you know where I grew up, you would know that is Pittsburgh Pennsylvania. Knowing that it would be easy to guess I’m showing my team color for the Pittsburgh Steelers – Gold and Black! Well in this case it is Crushed Curry and Black but that works for me! Stamp flowers using Crushed Curry and center and leaves in Memento Black (sorry Jackie! 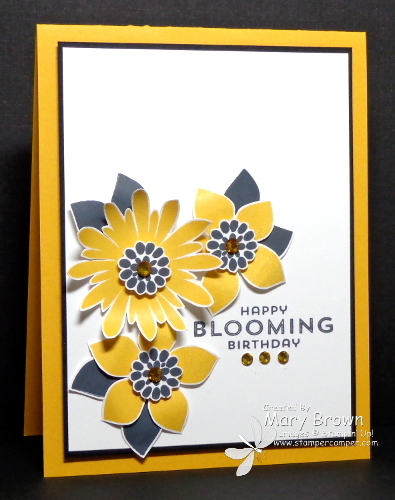 ), cut out using framelits, bend flower edges add centers using dimensionals then add to card front. Color some rhinestones using the darkest Daffodil Delight blendabilities (sorry…I know they are not available anymore but I do LOVE them!) and add to centers of flowers and under the greeting. This entry was posted in SUO Challenge and tagged Flower Patch. Bookmark the permalink. Sadly, if you were a Packer fan… you would have “normal” colored leaves. I really like this card and the colour’s you used. So bright and happy!